Overall Impression: This important Latin language classic, written c. 45 BCE, is short but rather tough going for a nonhistorian, even in English. But it is interesting to see the development of a complex and increasingly powerful dictator and general. The Oxford edition does a good job of spelling out where and to what extent the author is deceptive or self-serving. The nomen, the clan or tribal name (aka "gens" name), was similar to our surname. These include Julius, Domitius, etc. By the end of the Late Republic there were 35 major (voting) tribes. The outbreak of civil war. Caesar invades Italy, Sardinia, Sicily. Massilia refuses to admit Caesar. The campaign of Ilerda and defeat of Afranius and Petreius. I.1 - 6 Events in Rome, early January 49 BCE. Flight of the tribunes to Caesar. I.4 Caesar outlines the motives of his enemies, including M. Porcius Cato (Cato). I.5 -6 The pro-Caesar tribunes have to flee for their safety to join Caesar [in Ravenna in Cisalpine Gaul]. Decisions about Caesar's tenure in command are made January 7... Pompey works to line up allies including King Juba [of Numidia]. The other consul in 49 BCE is Gaius Claudius Marcellus (Marcellus) [who is less opposed to Caesar]. Caesar says "the laws of god and man were overturned." I.7 - 12 Caesar invades Italy while continuing to negotiate for a settlement. He sets out for Ariminium in NE Italy just south of the Rubicon [i.e., no longer in Cisalpine Gaul], where he meets with tribunes Antonius and Cassius. [According to Plutarch, he says "The die is cast".] While Caesar pays lip service to his civic duty, he also states "his [Caesar's] standing [acc. 'dignitatem' fr. dignitas] had always been his first consideration, more important than his life". His enemies were out to destroy him. He makes proposals to equitably reduce Pompey's and his armies... Gaius Scribonius Curio (Curio), Caesar's ally, takes the town of Iguvium. Caesar refers to himself as Imperator [a title of honor originally meaning victorious commander but eventually coming to mean general and then emperor]. I.14 - 23 Caesar advances south and besieges and captures Corfinium. I.24 - 29 Pompey's forces escape from Caesar at Brundisium and cross the Adriatic to Epirus. Caesar attempt to block the eastern port of Brundisium [on the heel of Italy]. Pompey refuses to meet with Caesar. He assembles many ships and successfully sails across the Adriatic to Epirus (March 17, 49 BCE). Caesar abandons the effort to pursue Pompey. I.30 - 33 The capture of Sardinia and Sicily. Caesar in Rome. Caesar sends Quintus Valerius to capture Sardinia, and Curio to Sicily, while he himself goes to Rome, where he meets with the Senate. There he defends his actions and speaks bitterly of what his enemies have done, suggests he may run the state by himself. He is obstructed by Lucius Metellus and other Pompey adherents, and decides to travel on to Further Gaul ("ulteriorem Galliam"). I.34 - 36 The siege of Massilia [Marseilles] commences. Domitius has become proconsul of Gaul and has been sent to gain control of Massilia. The Massiliots close their gates to Caesar. Roused by their hostile actions, Caesar commences a siege against Massilia. He also places Decimus Junius Brutus Albinus (Decimus Brutus) in charge of his ship fleet there. 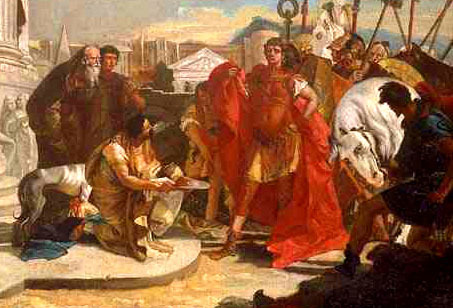 Caesar sends Gaius Fabius (Fabius) on to Spain as his deputy. Pompey has sent Lucius Afranius (Afranius) and Marcus Petreius (Petreius) as his deputies (legati) to Nearer Spain (Hispania Citerior) and they decide to join forces at Ilerda. Marcus Terentius Varro (Varro) was sent to Hispania Ulterior as legatus. Afranius begins attacks on Fabius's forces. Caesar arrives at Ilerda on c. June 23, 49. Afranius declines Caesar's invitation to engage in combat immediately. Ilerda is on the Segres river, north of the confluence with the Cinca river (the Ebro river enters a little further south). Battle begins, and is inconclusive. Unusually heavy rains follow, and Caesar is cut off from resupply convoys coming from the east and across the Segre River. In contrast, Afranius is well supplied and resupplied. Caesar's men make ships like those they found in Britain and successfully cross the river upstream, recovering the supplies brought by the convoy. Caesar's ships are less skillfully built than those of the Massiliots and outnumbered, and the sea battle there (late June) is inconclusive. Meanwhile things are looking up for Caesar in Ilerda. There are continues desertions to Caesar's side, fighting resumes, slow progress. Caesar maintains maximum mobility by not permitting his men to erect tents. Finally on August 2, Caesar has cut off the enemy from water, fuel, and food, and they surrender. Again, Caesar demonstrates great leniency to the soldiers and to their leaders. Siege and surrender of Massilia. Gaius Trebonius (Trebonius, Caesar's legatus) conducts the siege of Massilia using a variety of siege machines including towers, a siege-ramp, and a "tortoise"
Caesar tells of Curio's carelessness in now adequately guarding the Sicilian Straits, thus allowing Lucius Nasidius to bring more ships to the aid of Domitius at Massilia. He battles with Decimus Brutus, but withdraws from the sea fighting defeated and sails for Spain. Curio sets out in August 49 to sail for Africa, taking fewer legions than he has been given, out of over-confidence and the low esteem he holds for the governor of Africa, Publius Attius Varus (Varus). He is opposed near Anquillaria by young Lucius Caesar (a Pompeian) but the Caesarians successfully land and form a camp near Utica at the River Bagradas. Varus' troops are encamped next to Utica. In a note of Caesarian irony, Curio is hailed as imperator (victorious general) for his minimal heroic deeds (rebus gestis). Curio learns that King Juba of Numidia [west of Africa] is sending large reinforcements to Varus. Curio calls a war council and exhorts his men to fight nobly. In a first battle, Varus's troops are routed, and he is wounded. Curio sets siege to Utica. Curio however becomes misled as to whether Juba is coming with his reinforcements. In a series of mistakes by Curio from over-confidence and poor judgment, Saburra (Juba's military commander) entraps Curio and his army is slaughtered. Only a few are able to escape on their ships, and King Juba takes several senator captives back to Numidia for display and execution. Caesar crosses to Epirus to face Pompey. Caesar receives reinforcements, checks Scipio. He blockades Pompey outside Dyrrachium but is defeated. Flight and death of Pompey. Start of the Alexandrian War. III.1- 5 Caesar in Italy. Summary of forces available to Caesar and to Pompey. Caesar is dictator in Rome, and in the consular election he is elected consul along with Publius Servilius Isauricus. But he stays in Rome only 11 days, then heads to Brundisium. He is trying to gather up a fleet, but there are insufficient ships available to take his entire army across the Adriatic in one trip. He summarizes Pompey's forces and supplies gathered in Epirus. Pompey holds important coastal towns including Dyrrachium, Apollonia, etc. On January 4, 48, Caesar crosses the Adriatic and lands the next day in Epirus at the Ceraunian range [modern Albania] at Palaeste. Caesar's troops attack Oricum. Caesar sends his ships back to Brundisium to bring the rest of his army--and Marcus Calpurnius Bibulus (Bibulus) attacks the ships, burning many and killing many of the men. One of Pompey's commanders, Marcus Octavius, reaches Salonae, but the locals resist the Pompeians. Caesar desires to send peace overtures to Pompey via Lucius Vibullius Rufus... Vibullius goes to Pompey (who is inland, in Candavia) and informs him of Caesar's presence in Epirus, and Pompey marches toward the coast. Caesar takes Oricum and Apollonia. Pompey takes Dyrrachium. Caesar makes his winter camp near Apollonia, just south of the river Apsus from Pompey's camp (which is just across it to the north). Caesar's ships are blockaded and prevented from reaching Epirus with supplies and reinforcements. He successfully conveys the message to Quintus Fufius Calenus (Calenus) not to attempt to bring the ships over. Caesar notes "thus the preservation of the army hung on a matter or minutes and a remarkable chance". Caesar blocks the Pompeian commanders Lucius Scribonius Libo (Libo) and Bibulus from landing on the Epirus coast, and Libo resorts to a ruse, pretending to want to negotiate for peace. Bibulus falls ill and dies. Pompey refuses to talk peace. It has been many months of waiting and still the ships and legions have not come to Caesar. Libo blockades the Caesarian ships at Brundisium, but Marcus Antonius and Calenus successfully break the blockade and sail for Epirus. Coponius attempts to attack them, but they sail past Dyrrachium and land to the north at Nymphaeum. Antonius disembarks his troops at the nearby town of Lissus, and sends a message to Caesar. Caesar marches north and joins Antonius. Scipio turns his back on the Parthian enemy at his borders and decides against plundering the temple at Ephesus in order to come to the aid of his son-in-law Pompey. ... Caesar heads for Asparagium and offers battle to Pompey, which is declined. JC reaches Dyrrachium, and begins to wall in Pompey. Clashes. III.47 - 55 The nature of warfare at Dyrrachium. Temporary stalemate. Pompey is well-supplied initially while Caesar is low on food, but eventually Pompey is also in need of supplies. Publius Sulla attacks Dyrrachium, but breaks off the attack prematurely. III.57 - 58 Further abortive peace negotiations. Pompey's cavalry starve. Caesar sends a message of peace to Scipio but this fails. Pompey's horses are starving. There are key deserters from Caesar, two Allobroges, and they carry key tactical information to Pompey. Pompey succeeds in breaking out of the siege by boat, attack the Caesarians from two sides, rout Caesar's men. Antonius checks the attack temporarily, but Caesar's cavalry is routed, and he is nearly defeated (July 7). Caesar says that he was saved from total destruction only by Pompey "did not dare for some time to approach the fortifications and that his cavalry were slowed down in their pursuit by the narrow gaps [in the fortifications]..." Pompey is hailed as imperator and his overconfident men begin to plan how they will divide up the spoils of victory. Caesar notes "... they failed to remind themselves of the everyday accidents of war, how factors which are frequently trifling--mistaken suspicion, or sudden alarm, or religious scruple--have caused great disasters..."
III.73 - 83 Caesar withdraws to Thessaly and encamps near Pharsalus. Pompey's army comes up with him. Caesar marches through Thessaly to rest and resupply his troops. He exhorts them to redeem themselves. Rumors of his defeat spread, and the local peoples are more resistant to him. Gnaeus Domitius Calvinus meets up with him at Aeginium. With his forces now united, he attacks the Thessalian town of Gomphi, which resists, and he allows his men to plunder ruthlessly. The similar town Metropolis accedes to his demands and is spared, as they note the cruel example set by Gomphi. Pompey's men continue to overconfidently plan for their winnings. August 9, 48. Caesar has 1000 cavalry versus Pompey's 7000. The battle lines are drawn near Pharsalus and the Enipeus River (in Thessaly). Caesar exhorts his troops. The trumpet calls them to battle. The heroic pronouncement of Crastinus. Pompey makes the mistake of repressing his troops' normal excitement for battle. Caesar's brilliant strategy causes Pompey's larger cavalry to be routed. Pompey flees to his camp, Caesar attacks his fortifications. Caesar takes his camp, notes the luxury there. Pompey flees to Larisa. Domitius is killed in the hills. Pompey finds he does not have support in Mytilene, Cilicia, and Antioch etc., and flees to Egypt. He is given refuge by Ptolemy XIII in deference to the ties of friendship and hospitality Pompey enjoyed with his father Ptolemy XII. But the king's regents make a secret plan--they send Achillas and Septimius, who kill Pompey, along with Lucius Lentulus. Miracles occur when Caesar achieves his victory over Pompey. Caesar heads on to Alexandria, where he involves himself in the struggle for power between the boy Ptolemy XIII and his sister Cleopatra. Achillas comes with his forces to attack Caesar. Caesar takes Ptolemy XIII in his power. He takes over the Pharus (island adjoining Alexandria with a great tower lighthouse), and continues the fight against Achillas. [Caesar abruptly ceases his commentary at this point].